About Squonk Kit Which One You Like? 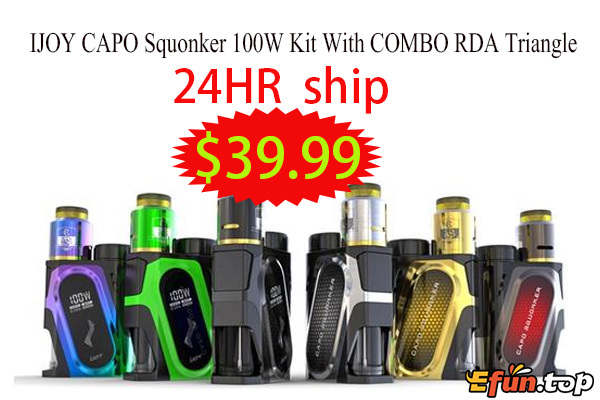 Today i will introduce you some Squonk Kit which 24HR ship, which one is your favorite? Aspire Feedlink Revvo Squonk Kit is the first squonk kit by Aspire, comes with large 7ml e juice bottle to satisfy your daily needed, which is powered by single high rate 18650 battery with bypass firing output modes with safety vaping. Feedlink Revvo features a ergonomic appearance and comfortable handle feeling. Feedlink Revvo Squonk Mod is a bottom feeding box mods, features a intelligent battery indicator, and 5 protections for safer vaping. Included Revvo Boost Tank with 2ml e juice capacity perfectly fit Feedlink Revvo Mod, adopts ARC coil heads, flat Radial coil, to larger heating area, which features a BF pin to make it compatible with squonk mod. 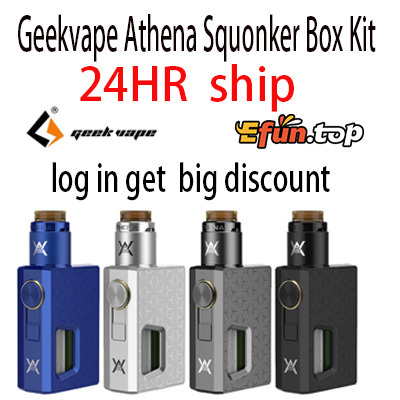 Athena Squonk Kit comes with a complete set of a mechanical squonk mod and a squonk RDA with 6.5ml juice reservoir. Athena was designed to be compact,lightweight and powerful. Athena Mod comes with a safety lock switch to prevent accidental firing, induction made out of high grade material for maximum power output while the Athena squonk RDA uses the top angled airflow system to reduce leakage. This kit is extremely portable and powerful. Geekvape GBOX Squonker box mod is a stunning technology catering to Squonk enthusiasts,integrating a Squonk-ready system with a high powered AS chipset, featuring real power output of up to 200W,full temperature control with TCR adjustments. An ergonomic design with enlarged OLED display.The kit combines the powerful GBOX 200W mod with Radar RDA to provide the ultimate auto-dripping experience. IJOY CAPO Squonk 100W Kit with COMBO RDA Triangle, the latest squonk kit from IJOY, is powered by a high rate 20700 battery which is included in or 18650 battery and maximum output can be reached to 100W with great vaping experience. IJOY CAPO Squonk mod comes with a large 9ml e-juice capacity as a bottom feeder for long-lasting vaping device. Here comes a large fire button for CAPO Squonk Mod. COMBO RDA Triangle features a double gold-plated triangle build deck with side air-flow control system with awesome vaping flavors.